In her book The Mushroom at the End of the World: On Possibility of Life in Capitalist Ruins, Anna Tsing explores the possibility of these “unruly edges” as both metaphor and material for understanding our recent descent into the Anthropocene, a newly termed geologic era that scientists argue began with the industrial revolution or when human activity started to have a substantial impact on the earth.2 In the transition from an agricultural economy to modern capitalism, a narrative of progress and unfettered growth spread around the globe. Today, Tsing argues this tale of progress is quickly being replaced by uncertain and precarious conditions manifest as erratic weather patterns, nomadic lifestyles, police violence, temporary and immaterial labor, and volatile markets. We are left, as Tsing explains, in a capitalist ruins that demands a different set of responses and ways of noticing. Tsing points specifically to ecological systems and the ways in which certain species of plants, animals or entire biotic communities are adapting and thriving despite increased temperatures, toxic soils, and unprecedented human disturbance. We are now witnessing the rewilding of vast urban terrains, the rapid evolution of entire species, and the appearance of hybridized natural systems. Some scientists believe these phenomena offer a glimpse into what life will be like in a post-climate change or post-capitalist world, and perhaps present a valuable touchstone and guide as we negotiate Anthropocenic transitions. Here I want to engage Tsing’s line of inquiry, and apply this to the art world. To consider what an age of ecological and cultural precarity means for arts organizations and practitioners, and to speculate on how transitional ecological systems can offer both lessons and cautionary tales. Drawing from personal experience, I’ll share three examples of artists and cultural producers negotiating new configurations, languages, and ways of working to cope and make-do in the face of what Tsing calls “entangled ways of life.”3 My aim is to consider life in the margins, spaces of contamination and disturbance as something useful for imagining new futures in the face of shifting conditions and increasingly precarious realities. One of the oldest and largest living organisms on the planet is a mushroom. Actually, it’s a fungus covering 3.4 square miles in the Malheur National Forest in Eastern Oregon.4 This particular fungus is an Armillaria ostoyae, or honey mushroom, and while you may only encounter a tiny fragment on the surface, the entire fungus is connected beneath the soil through a vast network of root-like threads called mycelium. This mushroom is also a parasite. It ingeniously targets specific trees and slowly decomposes them. 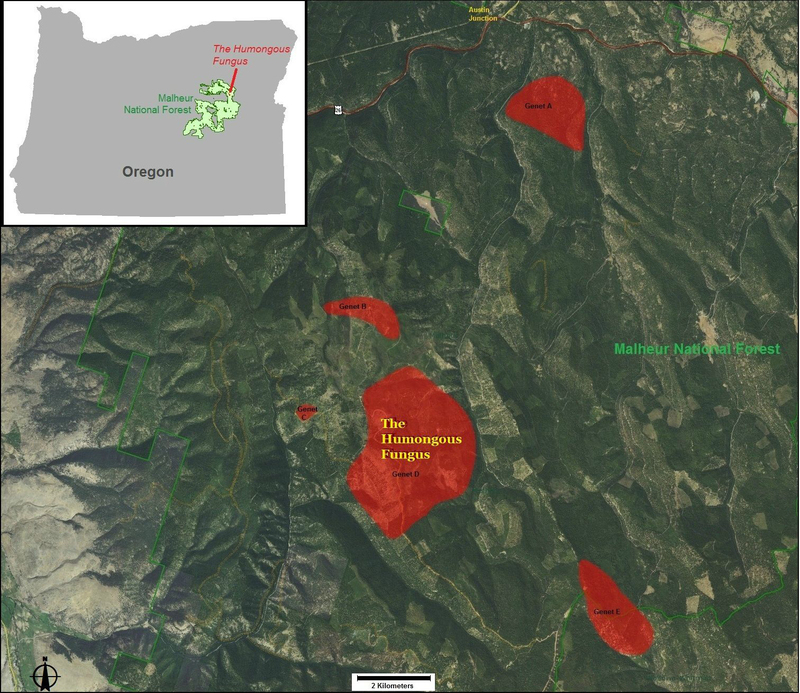 The US Forest Service has been in a decades long battle with the mushroom, attempting to eradicate and slow it’s process. Yet the mushroom continues to decay large swathes of the forest, despite intervention. If we extend this metaphor to the institution of art, we see some curious parallels. Just as the US Forest Service is maintaining a particular idea of what the forest needs and should be, the art world continues to persist with a business as usual market and outcomes-driven model. The consumption and circulation of objects and aesthetic experiences is still bound to short time intervals to satisfy granting requirements, executive boards, and supposedly finicky audience attention spans. The craze of assessment and exhibitionary spectacle has pushed this further, demanding a kind of quarterly reporting that corporations produce for their shareholders. Tsing’s notion of progress and growth is still very much alive here. In her essay “The Project Horizon,” Bojana Kunst describes the phenomena of “projective time,” a tendency for artists and cultural organizations to be constantly looking toward a future horizon – the next project, the next grant, the next opportunity – rather than be fully present in a particular moment.5 Kunst explains this has resulted in a continual state of “experimental precariousness” in which the artist sacrifices the time of the present for a speculative relationship with a future yet to come. While this has been a mainstay of the art world for some time, I would argue there are now different globalized stakes and hyperreal expectations that demand a constant showcase of recent achievements and plans for future projects that often make it difficult to operate critically or ethically. So, what might something different look like? And what can this giant fungus teach us? For some time now I’ve collaborated with an organization called Interdisciplinary Laboratory for Art, Nature and Dance (iLAND), a dance research organization based in New York City. 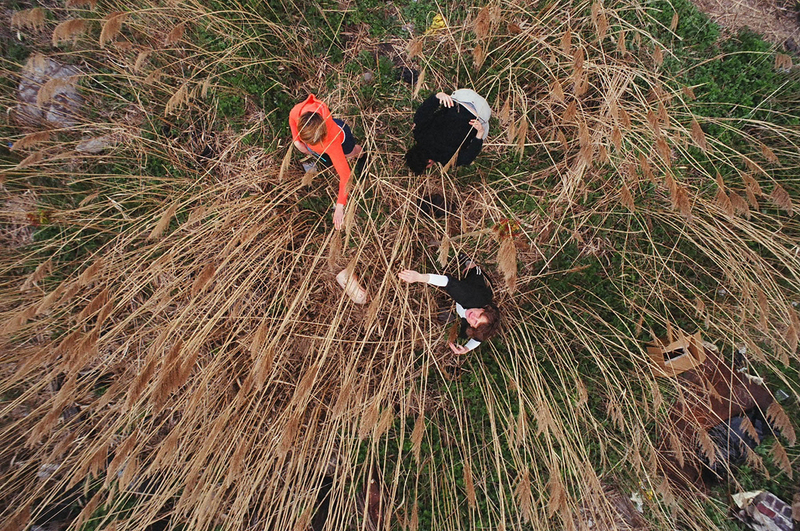 For over ten years, iLAND has brought together dancers and scientists, visual artists and designers to develop projects that explore social and ecological systems. Taking the form of a residency, collaborative groups develop a research-based project that integrates movement and practices from other disciplines to respond to a particular landscape or site. The duration and output of each project varies (typically 6-9 months), and results in some form of research and public engagement: a workshop, happening, or culminating performance. There is no prescription for what must happen in the process of working together. The only “rule” is that the structure is open-ended and uncertain. Some projects develop scientific research, others a performance or dance, and still others something else. Walking tours of lower Manhattan that trace original waterways; dancing with street trees in Harlem; foraging for mushrooms in Chinatown; dancing alongside migratory routes of birds in Flushing Meadows-Corona Park are just a few examples. What’s interesting here is that the projects and organization cultivate a network of people from different disciplines, just as the mushroom in Oregon creates a conduit to connect different organisms. In many ways iLAND’s process also mimics or at least gestures toward the indeterminate, sporadic and networked behavior of a mushroom. Each group, for instance, is purposefully given few constraints, which at times can be frustrating, and yet over time allows for a deep kind of autonomy and trust in process that many organizations have a difficult time sustaining. Residencies are necessarily long-term because they involve the investigation of an socio-ecological system like the estuary ecology of the Hudson River, how mice navigate subterranean infrastructure, or migration patterns of Canadian geese. As constellations of people and ideas form, webs of ideas push back and forth, while things emerge and recede, and over time a network unfolds and decays. This framework is of course not perfect, and still bound to granting cycles and outside-demands, which also produces its own set of issues: How does one document a process-based experiment grounded in kinetic experience? How do we translate this to the public? Is this art, or dance, or something else altogether? Yet, the iLAND approach does offer a platform that resists short-term spectacle, champions process, and encourages the development of new and uncertain practices in understanding human-nonhuman relationships. Novel Ecosystems as Cultural Model? Today we found another hole in the fence, large enough to fit my body through. As we duck under and cross the threshold, I can feel the temperature drop, and hear the sounds of insects and birds. We are walking through Hunter’s Point South on the southern tip of Long Island City, Queens, New York. It’s the summer of 2015. This particular site was once a large salt marsh and over time host to several industrial operations that were eventually abandoned in the late 1980s. 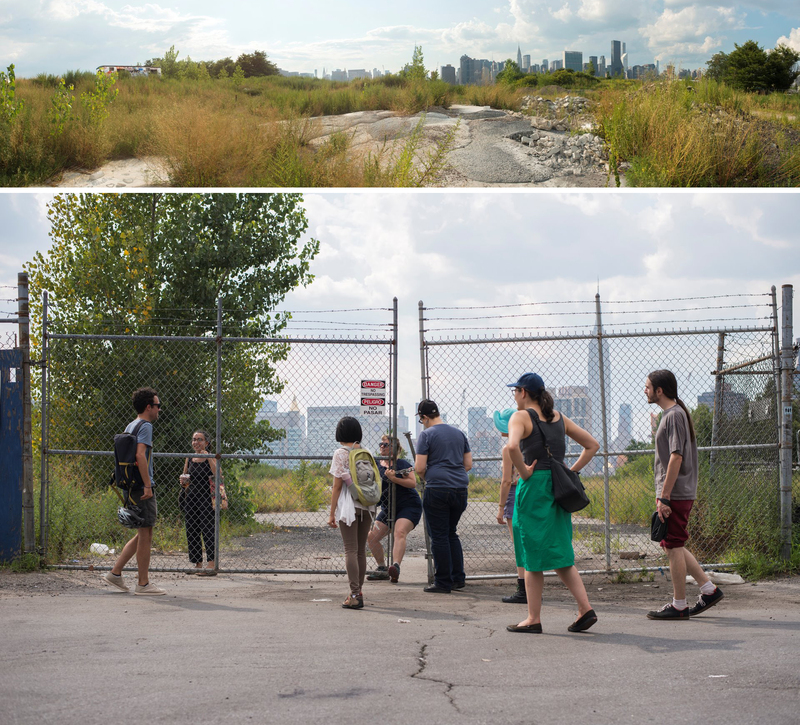 This desertion allowed a feral forest and meadow to emerge, creating a unique and wild landscape along the banks of the East River and Newtown Creek. The site has been rediscovered several times over, but most recently by a group of artists who have come together to document and respond in anticipation of development. To frame this investigation, curators Catherine Grau, Stephen Zacks and Nathan Kesinger launched Chance Ecologies, a framework for art and research projects exploring the value of undesigned landscapes and urban wilderness in New York City. Hunter’s Point South was chosen in large part because of the city’s plan to develop eleven condominium towers on the site by 2018. As a contributor and participant in the project, there are a few things I found interesting and perhaps valuable to a discussion on transitional organizational structures. The first has to do with the aim of the project itself, which is largely an examination of what some ecologists call “novel ecosystems,” and the other with the operating structure of the project and the collective of artists involved. Novel ecosystems, while still being defined, are understood as human-modified landscapes that are host to a range of introduced, invasive and native plants and animals.6 They often occur in spaces like vacant lots, ditches, agricultural fields, highway medians and post-industrial sites that straddle rural-urban divides. These systems have commonly crossed a threshold making it difficult to return to its original state, have a unique species composition, and are self-sustaining. What’s particularly interesting is that novel ecosystems may represent new forms of adaptation and symbiotic collaboration that could be useful in speculating on life in a post-climate change world. The plants that tend to be found in these spaces are drought tolerant, grow quickly, and can adapt to a wide variety of conditions. While conservation efforts continue worldwide, and with incredible merit, many ecologists are coming to terms with these new hybridized landscapes, which offer an array of services from habitats and shade, to erosion and temperature control among others. However, not everything about novel ecosystems is necessarily good. Scientists point out they can sometimes reduce biodiversity and “contaminate” landscapes by killing off certain native plants. And like the story of the mushrooms above, novel ecosystems are loathed by conservationists who believe preserving and restoring ecosystems to a pre-1600 ideal is the best way to promote biodiversity and the health of ecological and human communities. What is perhaps useful for artists and cultural organizers is noting the ways in which these biotic communities are able to cope with precarious conditions, and actually begin to form new hybridized relationships and species compositions that are resilient and often beneficial to the surrounding area. If we look at the organizational structure of Chance Ecologies, we find some similarities and deviations. First, Chance Ecologies did not emerge from a grant, commission, or institutional partnership. Rather, the idea was sparked by curator Catherine Grau’s fascination with wild and abandoned spaces in New York City. In early 2015, Catherine spoke to me about her idea for the project. There were concerns of getting permission and obtaining insurance, of perhaps forming a non-profit so we could apply for grant funding. I confided to her that it seemed unlikely she would get permission from the city, and that the last thing we needed was the stress of organizing a non-profit. In the end, she decided to simply invite a group of artists to the site and to let them react and respond. What unfolded was a range of projects from a pirate radio station broadcast from a fleet of kayaks on the East River, an archeological dig, a sound art piece exploring the site’s original coastlines, a virtual reality cinema experience, and a performance involving dozens of pink smoke flares, just to name a few. Like the novel ecosystems we were exploring, a constellation of creative practitioners had assembled and enacted an array of practices – a new species composition. The site itself had crossed a threshold several times over; from a salt marsh, to industrial wasteland, feral forest, and soon to be luxury condo. We each carved out a niche both physically and conceptually, and with only a few group meet-ups, launched a summer of programs. In June publics began to cross the threshold and climb the fence with us, and never once were the police called to interrupt or investigate our unsanctioned actions. And unlike a highly curated project a la Creative Time, Chance Ecologies was mostly improvised and free from curatorial restraints and bureaucracy. Over the summer months, there was a sense of coming together, of celebrating this wilderness that we had found and experienced as a group, and then telling this story to others. And what’s more, because the project avoided the lure of granting and non-profit status, the project was self-sustaining, allowing members to enter in and out of the collective as needed. Of course there were and are ongoing problems. The first iteration of the project culminated in a fairly traditional gallery presentation of artifacts and documentation. As soon as the project was transplanted into a gallery, I felt some of the magic and improvised experience had dissipated. The project continued this summer with a new site along the Flushing Creek, and a loose collaboration with the Queens Museum. Although the mission and aim of the project has remained the same, the sense of adventure and experimentation shifted with this new location, perhaps a consequence of institutional partnership or merely the geography of the site itself. Nonetheless, as a possible and speculative organizational model, novel ecosystems offer at least some ideas for how to re-think collaboration, site-specific response and public art making; Emerging when necessary, taking on new configurations, avoiding permission and cultivating new hybrid practices that respond to the detritus of industrial activity and urban life. I’ve lived in Brooklyn off and on for nearly 10 years now and I’ve become fairly accustomed to the realities of gentrification. Yet in the past few years this development has seemed to reach a fever pitch. My street is now a non-stop work zone with a construction dumpster on every street corner and the endless sounds of drilling. Almost daily, raw materials, sediment and earth are transported in and out of buildings to some unknown location. Just last week I went to get groceries and realized an entire building was gone. Demolished overnight. My walk to the subway is now filled with visions of hunter green plywood barriers, scaffolding, and construction notices touting a new world of luxury urban living that I feel intimately implicated within. This past spring, a friend and collaborator told me about a space she was using as a studio called Kilroy Metal Ceiling in Clinton Hill. At one time the space was home to the Brooklyn Metal Ceiling Company and more recently a factory and office space for Kilroy Architectural Windows. I would later discover the building was slated for demolition, soon to be another condominium. In the shadow of looming development, someone had convinced the developer to let artists use the space until construction would begin in the fall. The building contained a vast warehouse space with a rooftop, and offices on the second floor. My first encounter of the space was for an opening of a show called “Emergent Ecologies,” curated by Eben Kirksey and a “swarm” of artists that featured dozens of projects – bioart installations, living sculptures, paintings, photographs, and digital media – a Cricket Shelter designed by Terreform ONE, a rooftop garden of wild plants called a Sanctuary for Weedy Species by Ellie Irons, Mutant Fruit Fly Exchange by Eben Kirksey, a fermentation room by EcoArtTech. The space itself was raw and there were dozens of people circulating. Someone with a bullhorn announcing performances in one space, a screening in another room, a class visiting from Princeton, and people climbing onto the roof. This would not be my only encounter. About a month later, the same friend invited me to share her studio while she was on residency. I began to work inside the space, and meet the collective of artists involved. As I began to visit Kilroy more frequently, I witnessed all kinds of activity and meetings amongst the collective. 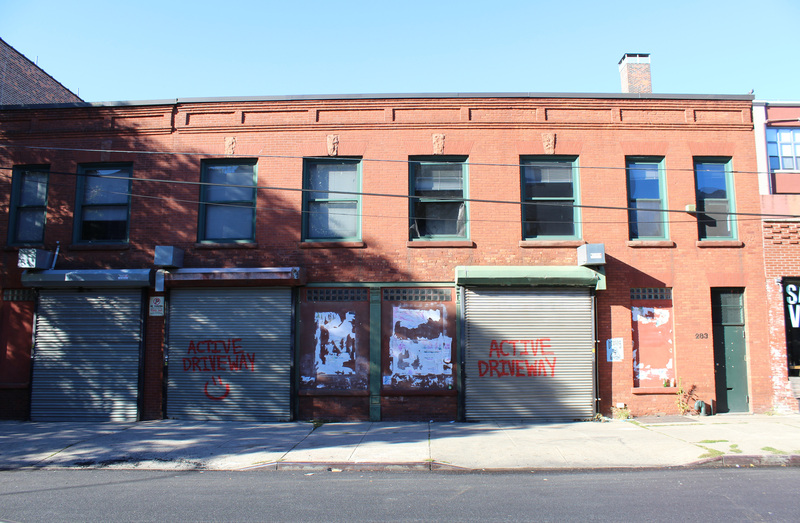 In just a few months, this abandoned building had became a cultural hub hosting dozens of exhibitions, performances, screenings, readings, political meetings and workshops – most free and open to the public. 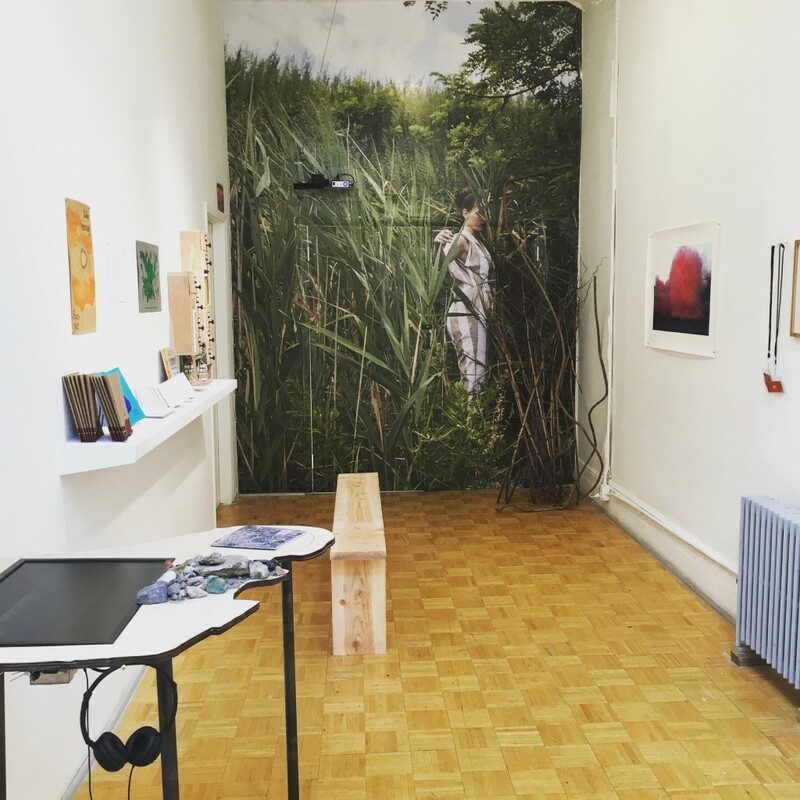 The programming for the space was by no means focused on ecology – rather, it was the epitome of interdisciplinarity. 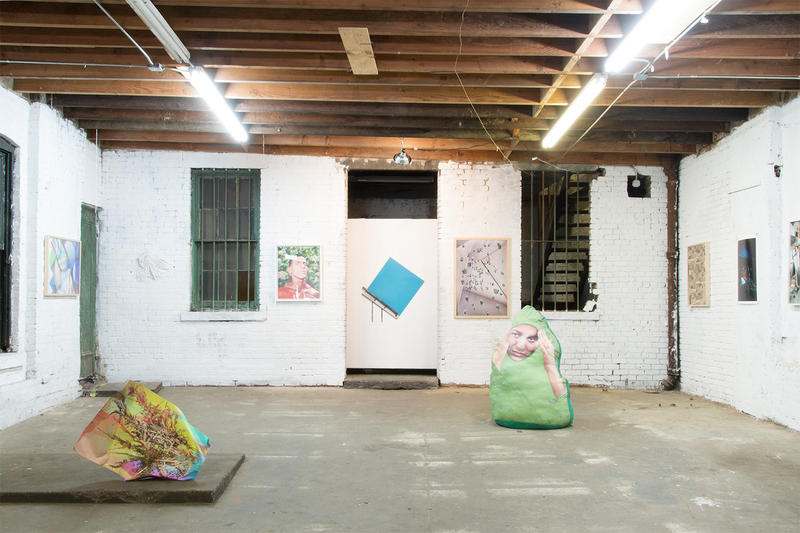 Within a few week’s time, the “Emergent Ecologies” show was down and the space is now being used by By Us For Us (BUFU) a Brooklyn-based collective of queer artists celebrating Black and Asian solidarity. 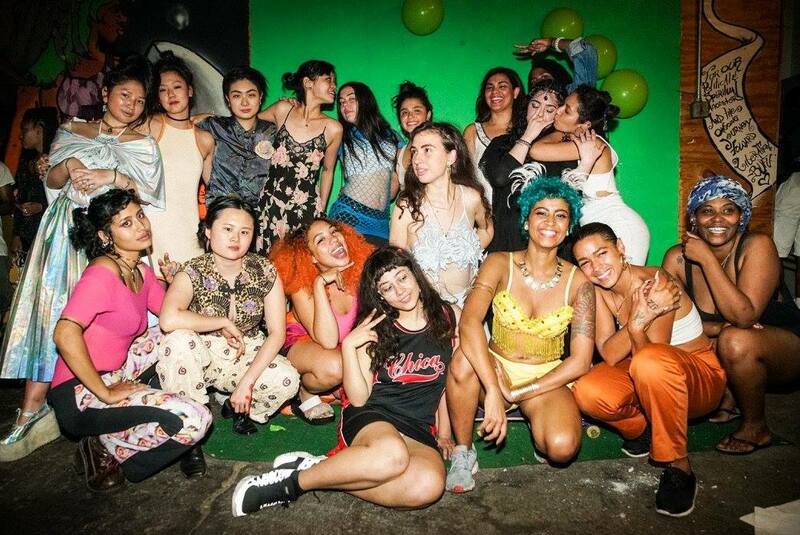 BUFU hosted a month-long series of performances, workshops, art happenings and events for and by communities of color. In an interview with VICE, organizer Tsige Tafesse explains, “BUFU is a decentralized multimedia documentary project…At first, it was just a documentary, and now we’ve gotten a space so there are physical manifestations to that documentary conversation.” During this time, I regularly walked in on people meditating on yoga mats, a dance party, #BLM workshops and other happenings. While artists making use of vacant space, occupying warehouses, or having trouble with real estate is of course not a new phenomena (see the organizations like Chashama or Loft Living by Sharon Zukin), it does feel like we are at a particular tipping point (or threshold) in large urban centers like New York, Los Angeles or Chicago. Space hasn’t been cheap for some time, nor available to a majority of working artists whom are being churned out of art schools like never before (see BFAMFAPhD7). Real estate speculation and urban redevelopment plans have consequently stoked the fires of an already precarious set of conditions for most cultural workers, and low-income communities. With more people (currently at 54%) living in urban areas than ever before, this issue will only worsen. Scientists are now finding increased evidence of “rapid urban evolution,” or the accelerated adaptation of plants and animals to urban environments.8 While we once thought evolution would take centuries (Darwin), scientists are now observing certain animals and plants evolving within decades. Menno Schilthuizen’s recent article in the New York Times has certainly raised eyebrows about this. He points out that French biologists have been studying the Crepis sancta noting the way in which the plant has adapted its seed dispersal strategy from lighter seeds carried by the wind, to heavier seeds that will have a much greater chance of finding a crack to take root in a sea of cement and asphalt,9 snail shells developing lighter colored exteriors to deflect the sun and decrease temperature, lizards evolving their feet to better grasp concrete surfaces, and still others adapting to an urban terrain. Jason Munshi-South’s Lab at Fordham University is also conducting research on white-footed mice, a mammal species native to New York that has quickly adapted to remaining green spaces.10 Over time an island-effect or siloing of habitat has resulted in the mice becoming genetically different based on their location. As a spontaneous and temporary artist-run space, Kilroy seems emblematic of a particular contemporary moment. A response to a deluge of gentrification, unprecedented flows of capital, and the reconstruction of entire neighborhoods. While this may be a stretch, it did feel like the impending destruction of the space encouraged a kind of hyper evolution of its use and purpose. This is not to say the pendulum does not also swing in the other direction. I have a number of friends who are “evolving” their tactics toward long-term and collective investment. Members of the NYC Real Estate Investment Cooperative, for instance, have been collectively pooling money to help civic and cultural organizations secure affordable commercial spaces for life. The evolution toward slow culture is also on the rise. Either way, an evolving proclivity to adapt and make-do in the face of dwindling real estate options, reduced funding and the privatization of the public sector may offer some lessons. I often encounter institutions that have been around for decades, but can hardly decide on the text for a program, let alone launch a series of exhibitions and projects, workshops or programs within a week’s time. The ability to act nimbly, to embrace uncertain arrangements, engage diverse cohorts of people and artists long-term, and to respond site-specifically is where the art world needs to head. And it’s important to understand the art world’s most recent response, sponsoring pop-up “socially engaged” projects, often does little to encourage real social change or support artists or communities authentically. In fact, the institutionalization of social practices has been a dangerous game of exploitation for years. So, perhaps we don’t need anything new, we don’t need more layers of “innovation,” or more bureaucracy, but to rather simply make-do with what’s being left behind. To let things decay, and to find value in the shifting terrains now emerging in the ruins of disaster capitalism. Here, there may be something far more valuable in the cracks and rubble than one may think. This animation by Christine Wong Yap and essay by Christopher Lee Kennedy have been commissioned by Temporary Art Review for Field Perspectives, a co-publishing initiative with The Miami Rail, Temporary Art Review and Common Field for the 2016 Common Field Convening.